I hope everybody had a wonderful weekend! =) Oh and I must add in that you should go see The Campaign with Will Ferrell if you didn't on the weekend! I did and it was a good laugh and just what I needed after a long, stressful week. The first photos are what my door was like up until recently Sunday. I have changed it, meaning the headers and what I want them to say and got more specific. The other header titles were more open and maybe vague to some or purely simple but I wanted to get into detail. So for my new header titles I broke it down and these are the categories I decided on with looking at my overall life. These are areas I want to make sure to keep focus on and not lose sight of pushing them out for "being too busy" to make time for these things in my life. The following of my newly redone chart is in an order of most importance to important, if that makes sense. I don't want to say least important because then it wouldn't be up there at all or shouldn't be up there at all. I always add in the Goals header, because before I wasn't going to but then I was like no I should have a goals header! I should have it because it holds myself accountable for things by seeing it visually instead of "oh I have or want to do this but not doing it or making excuses" I added that in and it doesn't have to be big goals but simple goals for the week like read for an hour every night or read 3 chapters this week. Whatever your little heart desires and soul wants you to achieve you name it, write it and see if you are holding yourself accountable for it! The reason why I like this idea and am mentioning it only now is because #one. I wanted to try it out first and #second I have tried it for several months. 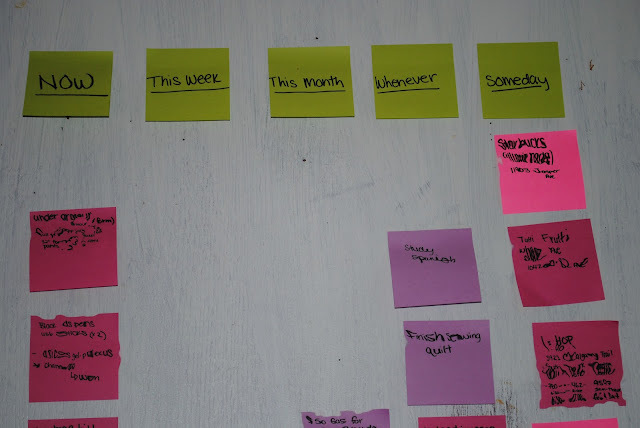 Having said that I have pulled off so many stickies and put up new ones, that I know this works for me and I get to see all the things accomplished! It's a great feeling and a great way to look at the end of the week and be like oh wow I accomplished a lot this week or I never really did one single thing. It holds you accountable and I think it's a great thing and something to keep you motivated. All you need to do this is a pack of sticky notes (post it's - if you want to be technical).. I like color so I got the colored ones! Some sharpies in various colors or you can stick to your simple boring black. This time I chose Gold for my headers in the Sharpie marker. Next each color of sticky notes is your choice to choose what you want under each category. For example if you want pink for family then you can specify it that way or you can simply use different colors for each category because it already has a header. It is all up to you! This is how I did mine and my category headers. For the headers of family, friends, and life I chose the pink sticky notes for those categories. (blue sharpie) Then for the headers of appointments, to do's, and work I chose orange stickies. (green sharpie) Next headers I chose blog and goals to do in green. (bronze sharpie) For my final catorgory I chose white for television shows (silver sharpie) because I usually forget or get busy and there are too many shows on in the fall to keep up and remember in my brain. I hope you all enjoyed this and have a lovely day today! I stay here with your permission, I invite you to my world I glad to be there.